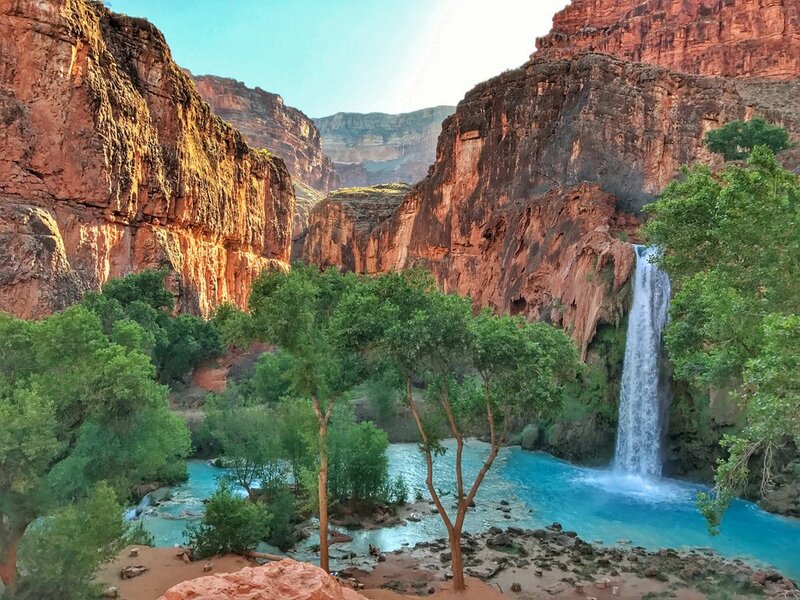 The waterfalls of Supai, Arizona are enticing, to say the least. If you follow any sort of adventure / travel / nature page on social media, you've probably seen some sort of post advertising this "hidden" gem. Unfortunately, it's hardly hidden anymore - but it still is very hard to get to, for various reasons. Havasu, a 100 foot fall located 1.5 miles beyond Supai, AZ - which turns out is also heaven on earth. The falls sit on the Havasupai Indian Reservation just outside of Supai, Arizona, located at the bottom of the Grand Canyon. Obviously, a very natural obstacle exists and that would be the trek to get there. It's a 10+ mile hike from Hualapai Hilltop to the campgrounds near the falls. Horses, mules, and occasional backpackers are all you will see on the long hike down. The mileage and your pack weight makes this a moderate backpacking trek, but the mostly inevitable heat of the canyon probably qualifies it as strenuous. Regardless, the hike alone is breath taking and worth it. It's the Grand Canyon for cryin' out loud! It certainly is not boring, contrary to some reviews I came across. Canyon crowds and hard workers- had to jump off the trail when you heard these guys coming through. Day hikes are technically not allowed (nor would a day be enough! ); but this brings me to the biggest obstacle of visiting Havasupai...the permits. The system is flawed but it is what it is - quite honestly, it leads you to appreciate visiting even more. 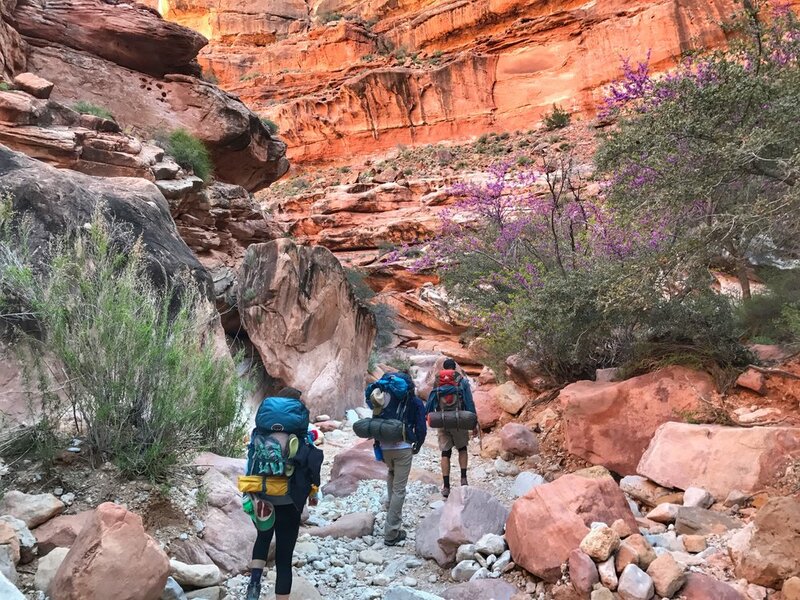 The campgrounds require reservations between March and October and the offices in Supai open up the phone lines for reservation sometime in February. As soon as they open, you and a million other people are trying to all call at once. It truly is luck of the draw, whether you get through to a person. Then it takes even more luck to get a spot on the dates you need. I would hike through this canyon even if there weren't waterfalls waiting at the end. How did we get so lucky this year? We thought it wasn't actually real until we showed up and they did in fact have our name on the reservation list. A day after the phone lines opened (and after a cumulative effort of approximately 262 busy signal calls), my friend Luke just so happened to be browsing the forums online and came across a very discreet notification from the National Park Service that the Havasupai campgrounds were now accepting online reservations through Sunrise Reservations. Yes we also felt this sounded sketchy, but desperate times...we jockeyed for a place in line for a few hours, had a couple of webpage crashes, some emotional meltdowns, but somehow we ended up reserving spots for the week we wanted. A day later, Havasupai announced the online system could not handle the traffic and it shut down the system until further notice. So as far as I know, the phone is the only option again but maybe by 2018 they will have the kinks worked out! As a side note, I also read that 2017 was completely booked after one week. Mooney Falls (compared to little baby Luke at the top) are about 2 miles from the start of the campgrounds, but I highly recommend making the extra effort to find a spot at this end. Less crowds, more water. Obviously. That brings us to early March, where the four of us finally started our road trip to Havasupai. We wanted to make the most of our one week off, so we made some plans, but we also wanted to go with the flow and let landmarks and road signs guide the way. First stop was Moab - Chris and I ran the Behind the Rocks 30k on Saturday morning while Kelsey and Luke hiked the slick rock and swung from arches nearby. Behind the Rocks starting line - we were camped about 15 feet away from this. Talk about convenient. Mad Moose events always puts on a wonderful race - I highly recommend! We drove straight to Flagstaff, AZ on Saturday evening for a nice hotel shower - we visited a local brewery and then stopped at Walnut Canyon National Monument on Sunday, our first Junior Ranger swear in of the trip (more to come). The monument protects cliff dwellings from over 700 years ago and was far more interesting than I expected. Our first swear in - Junior Rangers of Walnut Canyon. We made our way to Hualapai Hilltop from Walnut Canyon where we set up camp on the edge of a canyon wall and made friends with a family that drove all the way from Alabama to see the falls. The sunset was perfect and we could see the trail we'd be taking down into the canyon the next morning. Excitement kept all of us up I think. As I already mentioned, the trek to the campgrounds was long, hot, and extremely beautiful. It took us about 4 hours to get to the site we would call home for 2 nights. Our spot was on the edge of the campground, right above Mooney Falls and beside the stream that fed into the drop off. This is how I picture the word peaceful - so glad I brought the Eno! We spent that first afternoon hanging around Havasu Falls. The next morning (after the most scenic oatmeal I've ever enjoyed) we ventured down Mooney Falls and headed towards Beaver Falls. Beaver is about a 5 mile round trip hike from Mooney. It has several water crossings and the whole hike is a scene straight from Jurassic Park. One word of warning - the descent from this perfect little breakfast nook down to the bottom of Mooney Falls is not easy nor is it for those who are afraid of heights. Small holes have been cut through the canyon wall and wooden ladders and large chains with metal pegs have been haphazardly placed. The cut through is so close to the falls that you are constantly within misting distance so everything is wet and muddy, which makes holding onto the placings even more sketchy. If I did it again, I would absolutely bring gloves. The hike back up is much more bearable though, so if you can make it down you can absolutely make it back up! The view from the bottom is worth the stress though. Mooney, in all her big, bad glory! We spent a few hours laying on rocks and exploring the many levels of Beaver Falls. The falls eventually dump out into the Colorado River, so you do have the option to continue hiking past, but this is the last of the waterfalls. Petrified Forest - an interesting National Park, to say the least. Exploring, Learning, and Protecting - Petrified Forest National Park Junior Rangers. We also made a quick stop at Petroglpyh National Monument outside of Albuquerque - mostly for the Junior Ranger program, evidenced by the fact that this is the only photo I have from there. Camping inside of El Malpais National Monument, New Mexico. The arch of El Malpais was far more significant than we expected! Kasha Katuwe Tent Rocks National Monument was the most surprising to us! Such a cool place, very quiet, tucked into the middle of no where New Mexico. Rock formations and slot canyons. We were so glad we went out of the way to see this one (although there was no Junior Ranger program). Ah - I get it - tent rocks. Rio Grande Gorge Bridge, New Mexico - We ended up spending two nights in Taos - mostly because we loved it so much (and had a SWEET room at the La Fonda Inn!) but also because it was snowing everywhere between Taos and Denver and camping wasn't super appealing. One of my absolute favorites, Great Sand Dunes National Park was our last stop on the way home. We, of course, are also Junior Rangers of Sand Dunes. This road trip was definitely a favorite of mine and I'm so incredibly grateful to have had the opportunity to travel with some of my favorite people. Thanks to Chris, Luke and Kelsey for the good times! There is SO much to see in this country of ours and I hope that this can at least give you an idea of what's out there. If you haven't explored or visited some of our national monuments or parks, all I can say is don't wait any longer. I sincerely hope that these amazing places will be preserved forever - I don't think I'm alone when I say that I need these wild places and open spaces, just as much as I need clean air to breathe and fresh water to drink.